Experiment: Let a person sitting within a train-car measure the time it takes for a particle of light to travel between a held flashlight and a detector on the train's ceiling. Let T1 = the time measured by the train rider performing the experiment. Let T0 = the time measured by the observer of the same experiment standing outside the passing train. Let v = the speed of train as measured by the outside observer as it passes by. The lengths of the sides represented here are simply the (speed * time) = distances involved. 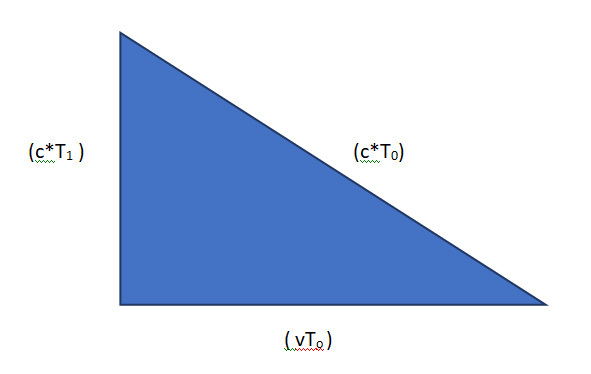 and then added together will equal the length of the hypotenuse squared. CONCLUSION: As indicated by the final equation, as the speed of the train (v) approaches the speed of light (c), the value of the right side of the equation goes toward zero, meaning: as the speed of the train increases, the observer (wearing a T0 watch) sees the train-rider's T1 watch ticking ever more slowly. That is to say, the train-rider's rate of the passage of time is slowed relative to the outside observer's rate of time passage.